The word "Caramel" may have different meanings, but when you hear the word "Caramels", you probably think of a small square-shaped, soft and chewy golden colored confection. These Maple Pecan Caramels still have that sweet and creamy caramel flavor that dissolves slowly on the tongue but, as their name implies, they also contain pure maple syrup and chopped pecans. These two ingredients add a rich and complex nutty flavor to the caramels that makes it just about impossible to eat only one. As I have said before, many approach candy making with trepidation and you can blame the problem on sugar crystallization (that is, a grainy textured candy). Luckily there are a few precautions you can take to help prevent this from happening in your kitchen. First, do not make candy on a humid day unless you have adequate air conditioning. Second, the equipment. It is important to use a heavy bottomed saucepan so the candy will not scorch under high temperatures. Be sure to use a wooden spoon to stir the syrup as the sugar crystals will not stick to wood as easily as they will to metal. And most importantly, buy a good mercury or digital candy thermometer with a metal clip so you can fasten it to the side of the pan. When using a candy thermometer make sure it doesn't touch the bottom of the pan as this can cause an inaccurate temperature reading. If you think your candy thermometer may be inaccurate, you can test its' accuracy by placing it in a saucepan of boiling water. The temperature should read 212 degrees F (100 degrees C). If you find your thermometer is off by a degree or two, simply adjust your recipe to take this into account. Another thing about candy thermometers are that they are fragile so after each use place in hot water (not cold) to dissolve the sugar coating. Never place a hot thermometer into cold water as this can cause it to break. And be sure to store your thermometer away from other kitchen utensils so it won't get banged around. Lastly, cleaning the saucepan can be a problem. The best way to remove all that hard caramelized sugar is to fill the saucepan with water and bring it to a boil. Turn off the heat and let it sit until the sugar dissolves. Before you begin making caramels make sure you are familiar with the recipe and have all your ingredients measured and within easy reach. This means having the butter, vanilla extract, and chopped pecans at your side so when the caramels reaches the correct temperature you can immediately stir these ingredients into the caramel. Now, this is the important part. To prevent sugar crystallization (which means a grainy texture) make sure to stir the ingredients constantly until they reach the boiling point. (This ensures that the sugar has completely melted.) Then, place a tight fitting lid on the saucepan and let the sugar syrup boil this way for a minute or two. (This allows steam to form which then condenses and washes off any sugar crystals that have attached themselves to the sides of the saucepan.) Then remove the lid and clamp a candy thermometer to the side of the saucepan. Do not stir the boiling syrup, just brush down the sides of the pan, with a heatproof pastry brush that has been dipped in warm water, to remove any sugar crystals that may have formed on the sides of the saucepan. To Toast Pecans: Preheat your oven to 350 degrees F (180 degrees C). Place the pecans on a baking sheet and toast the nuts for about 6-8 minutes, or until lightly brown and fragrant. Cool and then chop coarsely. Maple Pecan Caramels: Line the bottom and sides of an 8 x 4 inch (20 x 10 cm) loaf pan with foil. Lightly butter the foil. In a heavy bottomed 2 1/2 quart (10 cup) (2.5 liter) saucepan, stir together the brown sugar, cream, maple syrup, corn syrup, and salt. Place the saucepan over medium heat and bring just to a boil, stirring constantly. Once the mixture boils, cover, and boil this way for about 1-2 minutes. Uncover and clamp a candy thermometer to the side of the saucepan. Boil the mixture over medium heat (do not stir) until the temperature reaches 248 degrees F (120 degrees C). (If sugar crystals form on the sides of the pan, wash them down with a heatproof pastry brush that has been dipped in warm water.) Remove the pan from the heat and stir in the butter, vanilla extract and chopped nuts. Carefully pour the mixture into the prepared pan and spread evenly with a small offset spatula or back of a spoon. 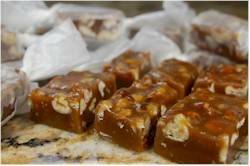 Leave to cool at room temperature for about an hour or two, or until caramels are firm. To cut into squares: Lift the caramels from the pan by holding onto the edges of the aluminum foil. Peel pack the foil and, using a sharp knife cut into one inch (2.5 cm) squares. These caramels can be stored at room temperature, between layers of wax paper, for a few days. But I like to store them in the refrigerator (for up to two weeks). Or you can freeze them for about two months. Makes about 32 caramels. Preparation time 45 minutes.